Years ago my mother and I took a three week trip to Europe in late autumn. We were to stop by Venice for two days, but loved the city so entirely, we stayed for ten. By day, we lost ourselves in back alleys and odd museums. By night, we found our way back to a little cafe whose specialty was seafood risotto. We were armed with little more than a rudimentary knowledge of Italian and a dictionary, but that trip still stands in my mind as perfect in every respect. One day, while wandering an obscure back alleyway, we came upon an extraordinary gate. 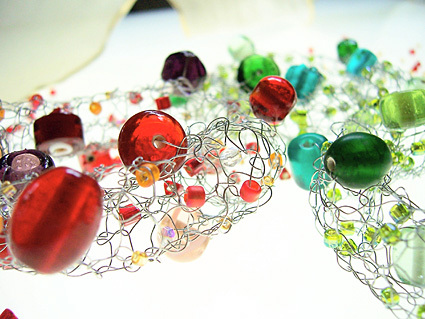 It was an abstract netting of wrought iron, with chunks of sea glass embedded among the strands of metal. There were blues, greens, reds, amber and clear pieces of every size. We stared open-mouthed as the afternoon light glanced across the glass, glowing and flashing. The Venezia napkin rings are my homage, small though it is, to the beauty of that gate, still bright and clear in my mind after so much time. They are best used for seafood risotto, a little bottle of chianti and fond memories. Measurements are taken after pulling fabric into shape. 1 set US #6/4mm needles: Bamboo is recommended, and you may find it easier to use two double-point needles rather than long straight needles. I used two double-point bamboo needles because they are short and not very slick, and I found it very easy to manipulate the wire. I had no problems with losing stitches. You can use any needles you like, though. Beads are placed between stitches. 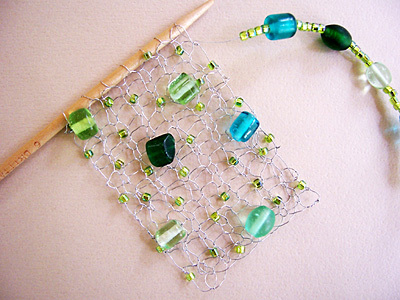 To place a bead in your work, knit the stitch before the place you want your bead to go, slide the bead up the wire until it rests next to your right needle, then knit the next stitch. It's as easy as that! Using color combinations that are aesthetically pleasing to you, pre-string beads in this pattern: [1 large bead, 5 seed beads] 11 times. Using the Backward Loop technique, CO 7 sts, placing at least 1 bead in the CO row. K 35 rows, placing approximately 2 beads per row. Five of the rows (or approx. 1 row in 7) will have to have only 1 bead; be sure to keep this in mind as you work, and plan accordingly. Place the beads in different places in the rows; you want to achieve fairly even coverage, with a seemingly random appearance. When all the beads have been used, cut the wire, leaving a 17-inch tail. Ensure that all the larger beads sit on one side of the fabric, so that they will face out when the rectangle is seamed. 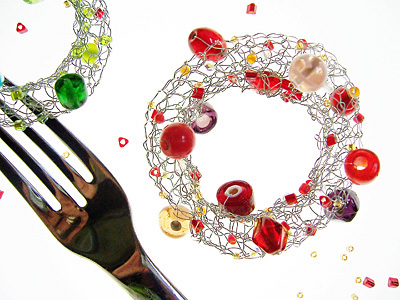 It is easy to push the beads through and close the wire behind, so they do not slip back through. Stretch rectangle so that it measures 2.25 inches x 5.5 inches. Remove needle from live stitches, inserting a piece of waste yarn through the stitches to keep them from unraveling. 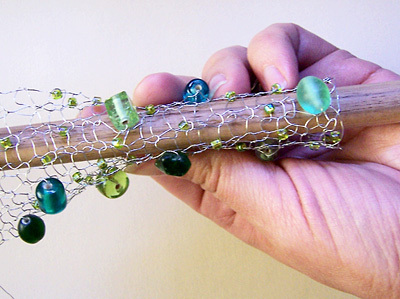 Wrap rectangle lengthwise around dowel to curve it into a tube (see photo), making sure the larger beads are on the outside of the fabric. Remove rectangle from dowel and graft live stitches together with CO edge. Remove waste yarn. 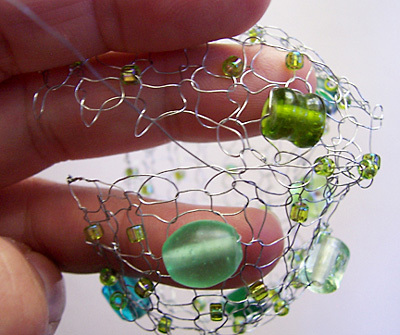 Without cutting wire, sew together edges of rectangle to form a tube. 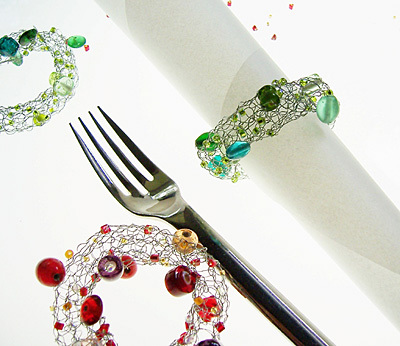 Wrap wire around itself several times and clip, being careful not to leave ends sticking out. Rosemary lives with three wonderful men in wine country, where she is a graphic designer and illustrator. 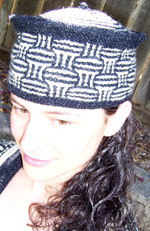 In 2005 she became a purveyor of shawl, scarf and sweater pins when she launched Designs by Romi. She's just happy to be mixing work with play. Drop by her blog to see what she's up to these days!